hahaha. its "my date with a vampire 2". one of the longest drama titles ever. too bored at home recently, so I watched this hong kong ATV drama on my mioTV. skipping some episodes and fastforwarding some scenes. 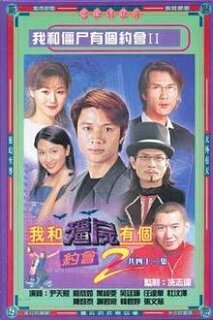 I should think I watched this my date with a vampire trilogy last time, but I have totally no recollection of what happened at the end. what a bad memory I have rite!? but hey, this drama started in 1998 for part 1, 1999 for part 2, and 2004 for part 3. I couldn't possibly rmb all the things since it was like 10 years ago! 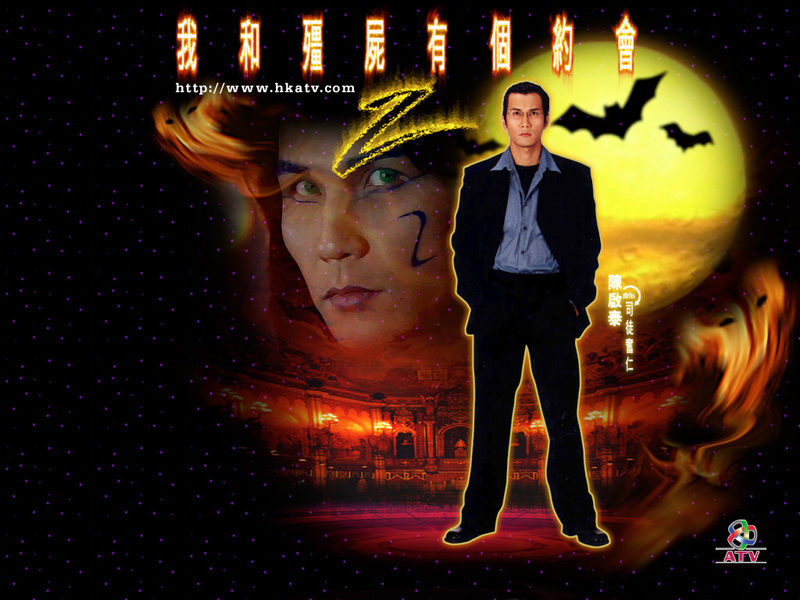 ma xiaoling and kuang tianyou are the main leads in this drama. look at those outdated shades! spells year 1999! 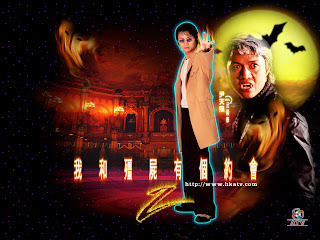 yepp and this woman here with the vampire king is 女娲. shes the creator of the world and mankind. these 2 are a couple. weird eh? she wants to come back and destroy the world as she sees that human has become hurtful and bad. but obviously the rest of the leads in the drama don't want that to happen. yes the bald man is the supposed baby. and the woman is the mum. after she gave birth her hair turned white. haha reminds me of rogue from X-Men. and so, Nino is actually not a disaster but rather he helps tianyou and xiaoling to fight against 女娲. but rmb 女娲? to destroy the world, she had planned a meteor to hit earth on year 2000 january, and the meteor had already entered the earth's atmosphere. so tianyou and xiaoling has to get the bow and arrow from the "pangu tribe" to shoot down the meteor. haha I know it sounds stupid, but trust me when u watch it u would feel ok de. BUT, the arrow was alr destroyed by the vampire king previously, so they had to sacrifice their lives to get the arrow to shoot down the meteor and save the world. the weird looking guy with the tall hat. 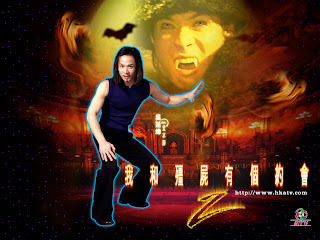 I don't know why I like him, coz he is quite a mad man whose vampire power is to enter ppl's dreams. but I guess coz he has a weird sense of style and always wears a hat. reminds me of the madhatter from alice in wonderland! I luv johnny depp. but thats about all the proper picture I can find of him. and gosh when I saw his real life photo I was not very shocked coz he is not shuai at all. lol. I repeat. NOT shuai. odd looking maybe thats why I like too. haha. erm. this is when tianyou becomes mad and powerful and ready for a duel. really LOL hor. so next is spoiler alert where I tell u who dies and who lives. as said previously, tianyou dies at the end. BUT let me tell u, he comes back in part 3 lah. ma xiaoling dies too. but comes back in part 3, with a heavy emphasis on her role too! I cant stand the fashion 10 years ago. quite laughable. but thats what ppl wear back then. 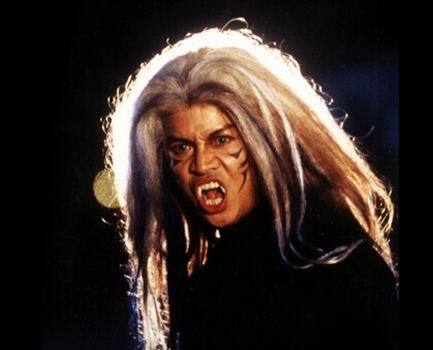 this is situ fen ren, another vampire who died under the vampire king at the end. forgot to say he's quite the important character who appeared in all 3 parts of MDWAV. the vampire king, who died. 金未来, who can be said to die under the vampire king during the 30+ episode. lol at her coat. 堂本静. died at episode 24-25, under ma xiaoling. after his wife gave birth to nino. so sad rite cannot see his baby and have to die. but he is a bad guy. LOL at his pose. wang zhen zhen. the luv of situ fen ren. and the only human here. she got killed by 堂本静 in episode 24-25. really can't stand their fashion le. see? zhen zhen. she looks so pretty here. 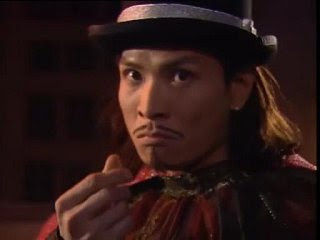 but anw, besides the point, to summarize, the only ppl who survived were kuang fusheng, tianyou's brother/son (who was a vampire at first but somehow at the end he turned human). and erm...gosh. no one else! all the other unimportant characters survived ba. I really forgot how they continue into part 3 but most of the important characters were back lor. but as different personnels le. weird weird weird. but. after all these years, other than the special effects and fashion which were atrocious, everything was good. the plot of part 2 was the best out of the 3. I rmb part 3 sort of sux. 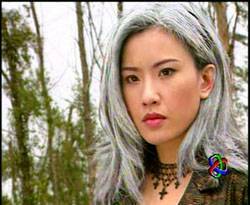 and I still don't think ma xiaoling is pretty although alot of ppl luv her. but she has nice legs though. throughout the drama the focus of her is on her legs as she always wears short skirts. haha. 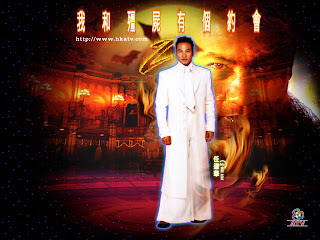 and I think kuang tianyou is not handsome at all. maybe thats why the characters in this drama are not that famous. heard from my hk friend that they are not famous actors in hk. (except for the vampire king, I rmb he is quite popular). its quite sad. but the drama did gain popularity in other countries outside of hk and I'm relieved at that. even if u have not watched part 1, its ok, part 2 doesn't have to link with part 1. actually all 3 can be watched individually on its own or linked tgt. doesn't matter.